A recipe perfect for that special dinner occasion. 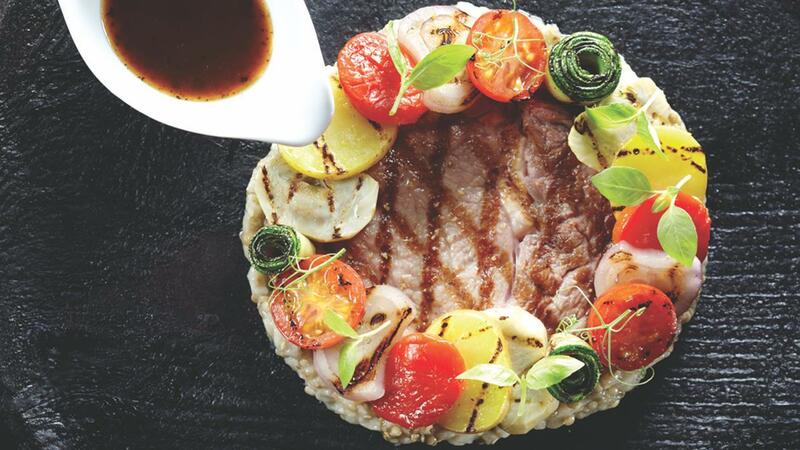 Juicy rib eye is served with a delicious and colourful garden medley of zucchini, cherry tomatoes, artichokes, bell peppers and topped with a decadent black garlic sauce. Portion the rib eyes into 150gm each. Season with salt and crush black peppercorn. Grill it over a griller to desired doneness. Blanch the potato in salt water till cooked and cut them in halves. Brush the bell peppers and aubergine with olive oil. Bake the bell pepper at 200 degree Celsius for 20 mins. Bake the aubergine at 200 degree Celsius for 30 mins. Peel off the skin of the red bell peppers and mould them. Remove the skin of the eggplant and crush it. Peel of off the skin of the aubergine and crush it, season with salt. Clean and turn the artichoke. Bring water and lemon juice to boil and season it. Cook artichoke in the stock till soft. Grill the potato, artichoke and shallot. Grate the baby zucchini and season them with salt. Grilled the new potato, zucchini and shallots. Roll the grilled zucchini up. Heat up sauce pot and lightly caramelize the black garlic. Crush or blend the black garlic to form a smooth paste. Add in red wine and reduce to half. In a mixing bowl, mix well Knorr Demi-Glace Brown Sauce Mix and water before adding into the pot. Bring to boil and let it simmer for 5mins. Place the aubergine caviar onto the centre of the plate. Lay the rib eye onto of the aubergine caviar. Place grilled vegetables on top of the rib eyes. Lastly add in cress, drizzle with olive oil and sea salt.